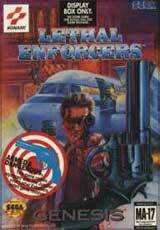 Lethal Enforcers W/Gun for Sega Genesis has you as a cop who is out to clean up the worst parts of Chicago. 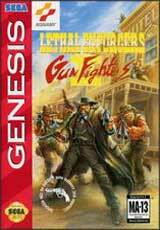 Plug in the included light gun and blast the criminals. You will have to keep an eye out for bank robberies, high-speed chases, hijackings, and gunrunners. As the game progresses, you'll be able to upgrade your weapon into a number of different firearms including: magnum, 12-round automatic, assault rifle, shotgun, machine gun, and grenade gun.